The Discovery Shores Boracay Hotel is located in Boracay, in the Philippines. 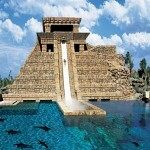 The hotel has several rooms and villas with views towards a swimming pool with a waterfall. The hotel has 87 double rooms and several villas. Each room has a double bed and the bathrooms have large bathtubs and showers with views towards the gardens. There are several types of rooms and villas at the hotel. The villas have a traditional style and views towards the sea. 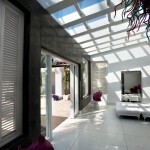 Each room and each villa has a floor to ceiling window with views towards the hotel’s tropical gardens. Part of the suites have ocean views from the exterior jacuzzi. There are iPod docks, coffee and tea making machines and television sets. This hotel was built and designed by architects and designers from Manila. 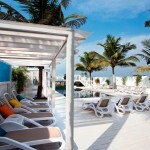 The hotel was built using traditional architectural styles without any detriment to the beach and the sea. Guests have the option to rent and buy part of the villas located on the hotel’s territory. 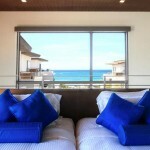 These villas are larger and have views towards the beach. There are two types of Junior Suites, those that have two queensize beds and those that have a kingsize bed. Each lounge has a sofa bed. The bathroom has views towards the garden, which is decorated with colourful stones. The One Bedroom Suites are suites with a large queensize bed, a bathroom, a living room with a bar and an L shaped sofa that can be transformed into a double bed. The One Bedroom Premier Suites are similar suites, with less space. 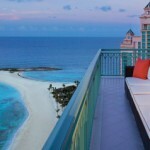 These suites have their own terraces, and there are suites with views towards the beach and the resort. The Two Bedroom Suites are suites that can accommodate up to six people. There are two double rooms with their own bathroom with a shower each, a living room with an L shaped sofa that can be transformed into a sofa bed, a dining room with a bar area and a balcony with views. The Two Bedroom Premier Suites are duplex suites. One of the double rooms is located on the ground floor, and the other one is located on the top floor. 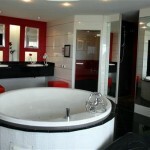 The suite has a large private terrace with a jacuzzi on the ground floor. The hotel has several restaurants where traditional food from the Philippines is served. Guests will be able to try local dishes, fresh seafood and a selection of wines. The bar has a variety of cocktails, margaritas and mojitos. Near the hotel guests will find the D’Mall, where there are more bars and restaurants. At the Indigo restaurant guests will find local Philippine dishes served with wine. Platitos is another restaurant located on the hotel’s territory and is known for its tapas and cocktails. The Sand restaurant has a selection of continental breakfasts, lunches and buffet dinners that guests will be able to enjoy by the sea. The plates used at the restaurants were made by locals. Guests will be able to enjoy views towards the sunset from the hammocks located next to the restaurants, where cocktails are served. The hotel spa is located next to the swimming pool. The spa organizes yoga classes and offers massages with natural, organic ingredients. The hotel has two large swimming pools and a gym. 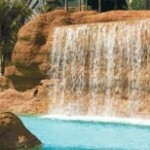 The pool has views towards the sea and a fourteen meter waterfall that flows to the pool located in the spa. The hotel has several halls, a room filled with local boardgames and a doctor’s practice. The Belize Halls can be rented for events of up to 60 guests. 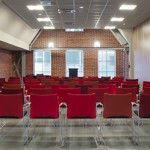 The Caledonia Hall and the Androz Hall are two large conference halls that can accommodate 60 guests. The Entertainment Hall can be used for events of up to 20 people. There are several other halls where guests will be able to celebrate their conferences and events. The hotel can organize group outings. Some of the activities offered are jet ski, kayak, kite board and visits to nearby islands. The hotel is located on the island of Boracay. Guests will be able to enjoy views towards the beach and the hotel’s tropical gardens from their roofs. There are many white, sandy beaches for guests to explore located near the hotel. The hotel has its own private beach on the coast of the Sulu Sea. 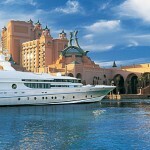 The hotel has a yacht that transports guests to and from the nearby islands. 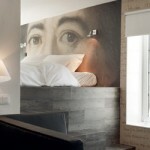 The Akersloot Hotel is located in Van der Valk, in the north of Holland. This hotel has standard rooms and several themed suites. 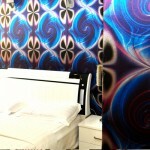 The hotel has several standard rooms, deluxe rooms and themed suites. Each one of the double rooms and suites has a large double bed, a bathroom with a shower and a northern décor. 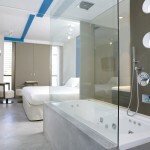 The standard rooms have two twin beds and a bathroom with a separate bathtub and shower. There are coffee and tea making machines and a television set. The hotel and the rooms have complimentary limited access to WiFi. The Standard Deluxe rooms are rooms with a double bed, a desk with a chair, a fridge and a living room area. Each room has its own bathroom with a jacuzzi and a shower. The Comfort rooms have a kingsize bed, a bathroom with a jacuzzi and a shower, a desk with a chair and a living room area with a fridge. Some of the Comfort rooms have two queensize beds and can be used as family rooms. The hotel’s family rooms are rooms that can accommodate up to six people. These rooms have two queensize beds and three individual beds. There is a bathtub, a shower and a double sink in the bathroom. Each family room has two television sets, a desk with a chair, a living rooms area and a balcony with a terrace. The hotel has nine bungalows. There are two types of bungalows, those that can accommodate up to five people and those that can accommodate up to six people. Each bungalow has several rooms that were designed for families and groups. The bungalows have a kitchen, a living room and bathroom on the first floor. The second floor has another bathroom and from two to three double rooms. The Diamond Suite has a kingsize bed and a large bathroom with a jacuzzi. Breakfast is served in the room. Price is between 147 and 157€ per night. The Lounge Suites are suites filled with technology. There are LED lights and a lounge area, a kingsize bed and a hydromassage bathroom with colourful lights. There is a flatscreen television screen with DVD. Price is between 195 and 230€ per night. 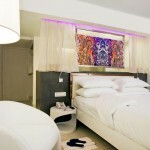 The Ibiza Suite has a large kingsize bed and a fireplace. The bathroom has a steam shower, a jacuzzi for two and a sauna. Price varies between 210 and 235€ per night. The Royal Suite is filled with antique style furniture. This suite has a kingsize bed, a double jacuzzi and a sauna. Guests who stay at this suite will be able to enjoy breakfasts directly in their rooms. Price is between 210 and 250€ per night. The Oriental Suite is an Asian suite. There is a large kingsize bed and a fireplace, and the bathroom has a double bathtub, a steam shower and a sauna. Price is around 210 and 250€ per night. The African Suite is a safari lodge. 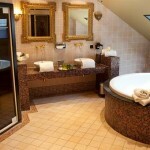 The suite has wooden furniture, a kingsize bed and a bathroom with a double jacuzzi, a steam shower and a sauna. Guests will be able to enjoy a breakfast in the suite, which has a fireplace and a price of 250€ per night. The Swimming Pool Suite has its own swimming pool. The main room has a kingsize bed, a double jacuzzi and a flat screen television. This room has access to the private swimming pool. Price is between 230 and 250€ per night. The Hollywood Suite has a round bed, a steam shower and a jacuzzi for two. There is a large stereo set and a flat screen television set. Price is around 260€ per night. The hotel’s Japanese suite is another oriental suite. Inside this suite guests will find a kingsize bed and wooden furniture. The bathroom has a steam shower, a jacuzzi and an infrared sauna. Price is around 260€ per night. The hotel has a restaurant where guests will be able to enjoy breakfasts, lunches and dinners. There is a terrace where they will be able to have lunch and dinner. Grilled foods are served at the hotel’s bar and at the brasserie. The dining area has access to the kitchens where guests can watch their food being prepared. There is a gym on one of the hotel’s floors. The hotel’s swimming pool is located next to the gym area. There are twelve conference halls where guests will be able to organize various types of events. Events of up to 400 people can be organized at the hotel. Brunches and private dinners are celebrated at one of the halls. The hotel is located next to Van der Valk, in the center of Holland. The city of Amsterdam is located a short distance away, filled with historical landmarks, museums and parks. Visitors will be able to visit several nearby cities. There are train connections to Alkmaar, Amsterdam and Haarlem. A short distance away is the North Sea. Guests will be able to explore dunes, lakes and nearby beaches. Bicycles and canoes can be rented if guests want to explore the region. A short ride away guests will find the resort towns of Bergen, Castricum, Egmond and Znadwoort. The nearby city of Alkmaar is known for its cheese market. The Seoul Sheraton Grande Walkerhill is located in the center of Seoul, in South Korea. This hotel has several rooms with their individual decorations and a large swimming pool. The 589 rooms and suites located in the hotel have double beds, a desk with a chair, a bathroom with a bathtubs and a shower. Each room has views towards the city. Each one of the suites is decorated in a theme. The Sheraton Grande Suite is the hotel’s Barbie suite. This room is decorated in shades of pink, with pink furniture and paintings of Barbies. The living room is decorated in pink, black and silver and has a Barbie sofa, several coffee tables and chairs. The bedroom has a pink double bed. The closet has several Barbie dresses. Price for a night in this suite is around 269€ per night, and price includes a continental breakfast at the Lounge Club and a cocktail accompanied by a cheese platter and local wines. The Pororo room is a room dedicated to Pororo the Penguin, a character, and is decorated in whites and blues. This room is located inside the Sheraton D Cube Hotel, a hotel that is part of a theme park that has several roller coasters and other attractions dedicated to this character. The Sheraton Incheon Hotel has a suite dedicated to the Sanri character Hello Kitty. The Hello Kitty Planet exhibition is located on the hotel’s ground floor, where visitors will be able to see and buy products from the Hello Kitty brand. The hotel has several bars and restaurants. One of the restaurants, the Ondal, serves traditional Korean food. The Myongwolgwan is known for its golbis dishes. The Clock16 is another designer restaurant where visitors will be able to enjoy traditional food with views towards the Han Mountain. The Club Lounge offers a selection of cocktails and has a business center with fax machines and photocopying machines. The hotel has its own gym. There are two swimming pools, one of them located inside the building next to the gym and the other one located on one of the hotel’s terraces. 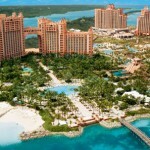 The hotel has a large mall where guests will find shops that sell products of more than two hundred brands. The casino is located on the B1 floor, and guests will be able to play blackjack and the roulette. The hotel has 14 conference halls where guests will be able to celebrate events. The hotel can organize events in the conference rooms and in the hotel’s restaurant, and the hotel offers translation services. The main conference hall is Sala Vista, where events of up to 1500 guests can take place. The Mugungwha hall is a large hall which can be converted into two halls. The Cosmos, Daffodil and Orchid halls are rooms designed for private dinners and events. 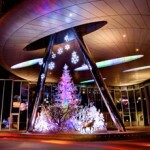 The hotel is located north of the center of Seoul, and the hotel provides a shuttle service to the city center. A short distance away from the hotel visitors will find many historical landmarks and monuments. Guests will be able to enjoy a stroll along the Han river and the Acha mountains. The Acha fortress is located near the mountains. The Achasan Ecological Park is located a short distance away. Swisstouches Hotel, a black pool, a restaurant with a British décor and varieties of noodles. The Swisstouches Hotel is located in the city of Xi’an in China. This hotel is located in one of the city’s highest buildings and has colourful rooms and several restaurants. The first Swisstouches hotel in the country has 318 rooms. Each rooms has a double bed, a lounge area and a bathroom with a bathtub. The carpets are black and red. Price varies from 140 to 300€ per night. There are rooms with two twin beds and rooms with a kingsize bed, and each room has Internet access. The lobby is made of white stone and is decorated with thick white columns. The colourful carpets limit the function of each space. The stairs are linked to the ceiling with metal cables and the ceiling is decorated with metal sculptures. There are several types of rooms at this hotel. The Hot Spring Luxury Rooms are decorated in black, red and white and have twin beds and views towards the city and the park. 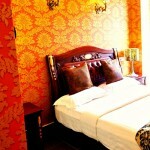 The Hot Spring Premier double rooms are cream coloured room with a large red and black carpet. 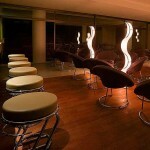 The lounge area is grey and is decorated with designer leather furniture. 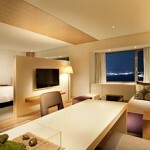 Each one of the Club Hot Spring rooms is decorated in neutral tones. Guests who stay in these rooms will be able to enjoy views towards the city and have a butler at their service. The Hot Spring Premier room is a large room with a separate lounge area, a bathroom and iPods docks. Guests who stay in these rooms will have a butler at their service. 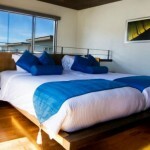 The Hot Spring Deluxe Suites are suites with a large living room with white sofas and brightly coloured cushions. These suites have views towards the city and the park. The Presidential suite is a suite with two double rooms, several bathroom, a kitchen, a conference room and a living room. The suite has views towards the garden and the city. Guests who stay at this suite will have their own butler at their service. The hotel has several restaurants. The Swisstouches Café has views towards the gardens and is a cafeteria with a buffet and a menu adapted to international guests. The Lord’s Home is a restaurant decorated in a traditional British style where guests will be able to enjoy traditional Chinese food. The Big China Noodle King is a restaurant specializing in several types of noodles, the dish that this city is known for. There are noodles from several of China’s regions and from Malaysia, Singapore and Taiwan, and these noodles are served with traditional local sauces and a sauce that is made in this hotel. Noodles are served in large bowls. The Big BBQ Flame Grill is a barbecue where guests will be able to enjoy grilled meat that takes place is the hotel’s garden. The Juice Bar serves a selection of fresh juices. 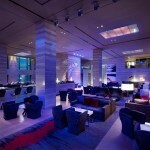 The Swisstyle Bar is the hotel’s bar, located on the hotel’s 30th floor. The bar has an observation deck with views towards the city. There are several private halls that can be rented for events. The hotel has a two storey spa. The spa has several jacuzzis and swimming pools, large turquoise bathtubs, a large black swimming pool and neutral decorations. Guests will be able to enjoy therapeutic massages and massages with natural oils in the massage rooms. Next to the spa there is a beauty salon with a hairdressers and a skin treatment center. There are several banquet halls and conference halls at the hotel, and these are decorated in neutral tones. The Gran Ballroom is a large halls where events of up to a hundred guests can be celebrated. One of the conference halls is decorated with cuckoo clocks. Guests will be able to organize private events in the garden, in the hotel’s bars and in the restaurants. The spa has several private halls which can be rented for events. The hotel is located in the center of the Xi’an. A short distance away from the hotel visitors will find the archaeological site of the Xi’an Terracotta warriors. The hotel offers a transport service to and from the airport. The hotel’s lobby offers guided city tours. Near the hotel visitors will find the city’s ancient wall, the Drum Tower and several museums. The Axel Hotel is located in Buenos Aires, in Argentina. The hotel has white room, a swimming pool with a glass floor and a restaurant where the tables are large colourful cubes. This hotel has 48 designer rooms. These double rooms are decorated with metal and glass and have a large bathroom and views towards the city. This hotel is geared towards gay couples. 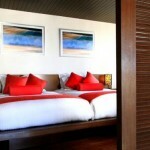 The are several types of rooms and each room has a kingsize bed. The hotel’s furniture was designed by several teams of local designers. Each room has Internet access, a safe, iPod docks, a lounge with a minibar, a flat screen television set and views towards the gardens and the neighbourhood. There are bathrobes and slippers in the bathrooms, and part of the rooms have large bathtubs with garden views. Price is around 129€ per night. The Axel City rooms are standard rooms, and there are rooms with twin beds and rooms with a double bed. There is a glass shower booth in the bathroom. These rooms have views towards San Telmo. The are Axel Superior rooms with two twin beds and with a kingsize bed. Some of the bathrooms have a shower stall decorated with tainted glass and others have a jacuzzi. These rooms have views towards the gardens and the pool. Tha Axel Suites are suites with a kingsize bed. The suite’s bathroom has a hydromassage shower and a jacuzzi. The living room has a designer sofa and a flat screen television set. Each suite has views towards the gardens and the pool. Guests will be able to enjoy the hotel’s many services. 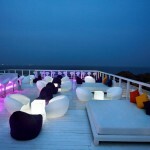 The hotel has several bars and a restaurant decorated with designer furniture and colours. Breakfast is served in the hotel’s buffet restaurant and guests will be able to enjoy freshly baked croissants. The Kitchen Restaurant has tables that have the shape of colourful cubes and this restaurant serves local and international dishes. Guests will be able to enjoy cocktails and coffee at the Cosmo Bar, located on a large terrace with views towards the neighbourhood of San Telmo. The Sky Bar is decorated with wooden panels and has a bar that serves cocktails next to the swimming pool. This hotel has two large swimming pools and a jacuzzi for guests. 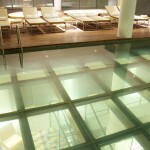 The floor of one of the swimming pools, the main pool, is made of glass. The hotel has WiFi for guests. 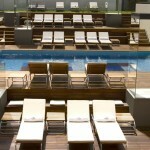 The hotel’s large spa is located on the rooftop, near the swimming pool with the glass floor. The spa has a gym and several jacuzzis and massage rooms. The hotel has several rooms where guests will be able to organize their events. Guests will be able to rent the hotel’s two bars, the restaurant and the conference room, which can accommodate up to ten people. The hotel can organize events and has audiovisual equipment available for larger conferences. Each one of the hotel’s floors has a business center with Internet access, a printer and several wooden chairs. Private parties can be held in the hotel’s designer pool and the pool area. The hotel can organize events and activities around the city center. The hotel is located in the district of San Telmo, a trendy neighbourhood filled with bars, restaurants and vintage stores. Guests will be able to visit its many art galleries. This bohemian district is one of the city’s most visited area. Guests will be able to enjoy some real Argentinian steak and dulce de leche in one of the nearby restaurant. The hotel is located a short distance away from the Museum of Modern Art and the National Museum of History. Next to the hotel guests will find the San Telmo Market. The Casa Rosada, the Metropolitan Cathedral and the Plaza de Mayo square are located within walking distance. 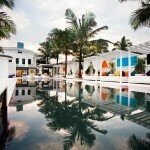 Art Hotel is located in Klang, in Malaysia. 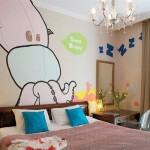 This small designer hotel has several themed rooms decorated with bright murals and colourful decorations. The hotel has 58 rooms. 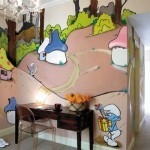 Each room has its own bathroom with a shower and themed murals. There are several types of rooms. There are coffee and tea making machines and LCD television screens in all rooms and the hotel has WiFi. Price is between 63 and 98€ per night. The hotel has fairy tale themed rooms, rooms with flowers and rooms dedicated to movies. There are rooms that resemble cities, allowing guests to visit Ancient Egypt and China. Guests will be able to stay in a New York room and a Paris room. There is an Elvis Presley room, a Lady Gaga room and a Michael Jackson room. Part of the rooms have views towards the lake. 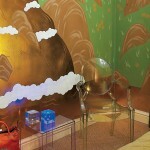 Guests will be able to relax in their themed rooms, some of which have views towards the city. Standard rooms have an individual bed and no windows. The Superior rooms have a queensize bed and no windows. The Superior Deluxe rooms have a queensize bed and a window. 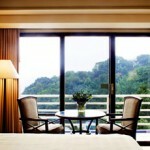 The Deluxe View rooms have a queensize bed and a large window with views towards the lake. The Twin Superior rooms have two large individual beds. The Family rooms have two queensize beds and a windows with views towards the lake. The Celebration room is decorated in black and white. The Breakfast at Tiffany’s room has a large double bed with black and white decorations seen in the film. 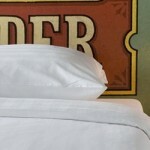 Your Royal Highness is a room decorated in a Victorian style with a hand carved wooden headboard. Roman Holiday is a room dedicated to the film, with a black and white design. Just Like Paradise is a room decorated with large clouds. The Snotty Peacock has two double beds and is decorated with the colours of a peacock’s tails. The Rock Solid room has tow beds and a brick wall. Another themed room is the Zen room, with two double beds and a relaxing light green colour. Bring in Da Funk is a funky room filled with colour. The Déja Vu room is a small retro style room. Pharaoh’s Conquer has a large double bed with curtains and Ancient Egyptian murals. In the African Fire room one wall is covered in a mural of flames. The Minimalist room is decorated in simple white and grey. The Radioactive room is a bright purple room with a double bed. On Cloud Nine is a blue room with a double bed covered by a white duvet, creating a cloud effect. In the Flourish room there are yellow cubes decorating the room. 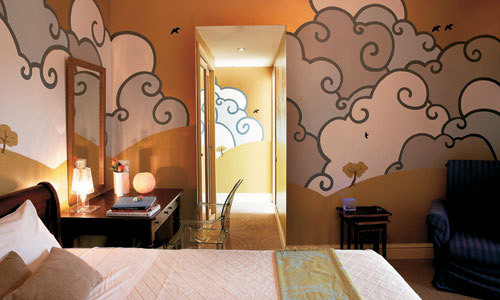 Crouching Tiger Hidden Dragon is an oriental themed room. Oakland is decorated with oak panels. The Scottish Castle has stone walls and tartan decorations. The Golden Fortune is decorated in shades of gold and there are several portraits above the double bed. I Feel Bubbly has many bright coloured spheres. 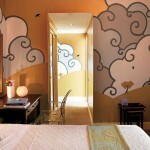 The Raveling has a double bed and murals of orange waves. Maharajá is an Indian style room with many golden decorations. Oopsy Daisy is abright yellow room. The Great Empire room glows in gold and has two large wooden beds with carved head boards. Autumn in Rome has two beds with carved leaves. Roman de la Rose is covered in small rosebuds. 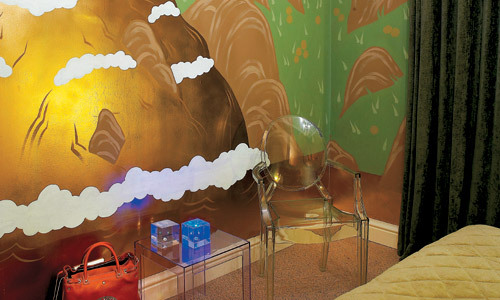 Glitter is a room decorated with shiny furniture and sparkling portraits. Leopard’s Phantasy has a double bed with a leopard print duvet. Sweet Dreams is known for its mural of a dark sky with clouds. Wall Street has murals of tall buildings. Guests will be able to enjoy breakfasts at the Hailam Coffee House, located next to the hotel. The price per breakfast is included in the room rate. Guests will be able to try traditional food at the Hailam Kopitiam restaurant. The restaurant is known for its local dishes and for its views towards the Shah Alam lake. The hotel has a large conference hall. Next to the reception guests will be able to buy tickets for nearby fairs and other cultural events. The hotel is located next to Section 7 of Shah Alam, in Klang, a city a short distance away from Kuala Lumpur. Guests will be able to visit I CIty and the Blue Mosque, one of the city’s main landmarks. The Sunway Lagoon Theme Park is located near the hotel. Guests will be able to golf in the city’s main golf courses. Extreme Park and the Bukit Cahaya Agricultural Park offer many activities. The area where the hotel is located is known for its traditional markets. Guests will be able to visit the Sultan Alam Shah Museum and its many art galleries. The Shah Alam Arte Gallery is next to the lake. Guests will be able to explore the nearby botanical gardens. 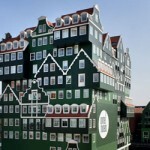 Inntel Zaandam Hotel is located in Amsterdam, in the Netherlands. The hotel is known for its façade, made from several green and white traditional façades. The hotel has 160 rooms and suites. All rooms are double rooms with a private bathroom and large windows with views towards the city. The region of Zaan was one of the country’s first industrial regions. 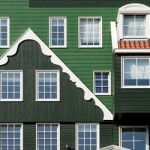 The hotel’s façade is green and is made up of several traditional Zaan houses. Each room is decorated with a typical traditional product. The Taste Deluxe Rooms are decorated in soft browns and mustard. These rooms have two beds and are dedicated to local products, with decorations of cookies, mustard and cheeses produced in the region. The Craft Deluxe Rooms are decorated in black and white. Each room has a kingsize bed, a bathroom with a separate shower stall, a laptop sized safe and black and white decorations. Part of the rooms have their own kitchen area and can be rented for long stays. The Factory Design Rooms are decorated with murals of an ancient port and several local factories. These rooms have a kingsize bed, coloured lights, a bathroom with a cascade shower, designer chairs and several large windows with views towards the region. The Tsar Peter Suite is decorated with portraits of the tsar and has antique furniture, similar to the furniture that decorated the Tsar’s housem that used to be located in this city. There is a large double bed, two television screens and a designer bathroom. Guests are provided with thick bathrobes, slippers and coffee and tea making machines. The Founders Junior Suites have a kingsize bed, a desk with a chair and a lounge area with a sofa. These three suites are located on the hotel’s top floor. 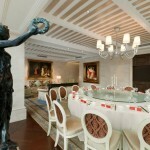 The suites are dedicated to the founders of the city’s main industries. Each suite is decorated with historical portraits of the founders and murals of the city, and each bathroom has a bathtub, a shower and a sauna. The Founders Suites are the hotel’s largest suites. Each suite has a double room, a living room with a desk and chair, a bathroom, iPod docks and a Nespresso machine. These three suites are the Bloemendaal family suite, the Albert Heijin suite and the Enricus Verkade suite, who were the founders of industry in this city. Each living room has iPod docks, coffee machines, a table and a flat screen television set. Guests will be able to enjoy views towards the region. These suites have a master bedroom with a kingsize bed and murals of city views. Each bathroom has a large shower, a jacuzzi and a sauna, and there are bathrobes and slippers for each guest. Price is between 113 and 190€ per night. The hotel has its own restaurant, the Puur Saen Bar and Restaurant. Guests will be able to enjoy breakfasts, lunches and dinners. The restaurant is known for serving dishes made from local and seasonal ingredients. Breakfast is accompanied by champagne. Board games can be enjoyed during dinners. The hotel’s spa is the Wellness Spa. 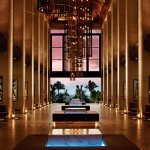 Guests will be able to enjoy traditional Turkish baths, a gym hall, several massage rooms, a sauna and a swimming pool. There is a lounge where guests will be able to connect to the Internet and the hotel has WiFi access. There are rooms where small pets are allowed. The hotel can organize events. Games are organized during conference dinners, family suppers and group events. Guests will be able to join in a game of CSI. Who is the Mole is another typical game where guests will have to guess which player kidnapped another member of the team. There are team games and a game of Trivial about Holland’s traditions. The hotel has several conference halls that can be used for events. Events for between 15 and 300 guests can be organized at the hotel. The conference hall has an industrial style and there is air conditioning and WiFi. At the hotel’s Tourist Office guests will be able to buy tickets for concerts and expositions, rent bicycles and visit the city’s markets. The hotel offers boat tours and visits to nearby towns, known for their traditional mills. 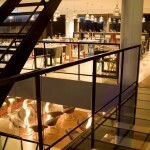 The hotel is located near Zaandam station, a short distance away from Amsterdam’s city center. Schiphol Airport and the RAI Congress Center are a train ride away. Guests will be able to enjoy bike rides across the city and along the canals. A short distance away from the city visitors will be able to visit the mills of Zaandam. Nearby guests will find the Alkmaar cheese market. 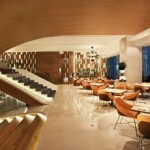 The Baby Grand Hotel is located in Athens, in Greece. 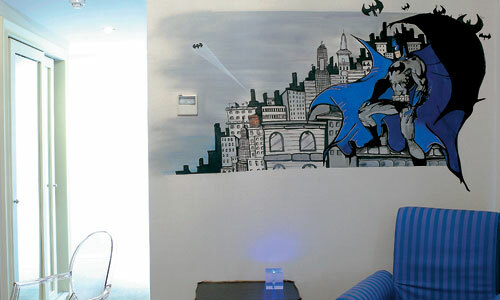 The hotel’s rooms are decorated with comic streets, murals and many paintings. The hotel has 76 double rooms, deluxe rooms and suites, all of them with their own bathroom. Each room has a theme and colourful decorations. 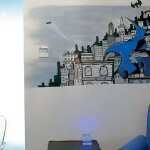 The rooms have air conditioning and are decorated with graffiti, murals of mountain ranges and comic strips. Each room has Internet access, a CD player and a television set. The bathrooms are decorated with marble. The Spiderman Suite is dedicated to Peter Parker’s character. Another room is decorated with antique style furniture typical of Byzantine Greece. The hotel’s Standard rooms have two individual beds and a marble bathroom with a shower. These rooms are decorated with colourful graffiti and murals that were designed by teams of architects, artists and urban designers. 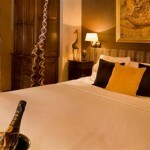 The Deluxe rooms are larger rooms with a double bed and a terrace with views towards the city. Each room has a theme. One of the rooms is dedicated to ancient Japan. Several rooms are decorated with murals with flowers, mountains and rivers. 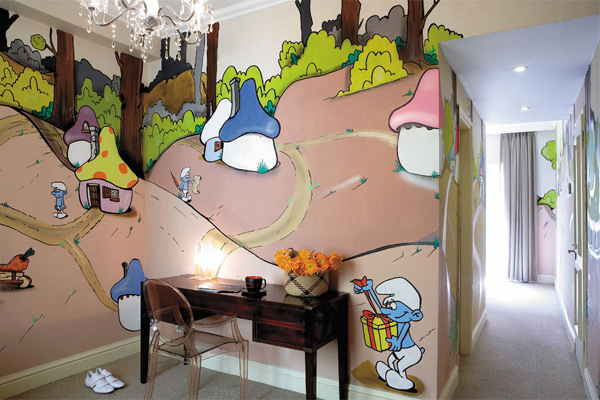 Some rooms are decorated with cartoon characters. 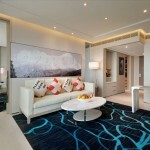 The Junior Suites are double suites with views towards Kozia Square. The Business Suites have a master bedroom with a bathroom, a desk and chair and a lounge. Each suite is decorated with art masterpieces, and guests will be able to stay at the green and white suite that has a sculpture of love and at the antique suite that has carved wooden furniture. The Penthouse Suite has a large master bedroom with a bathroom and a separate living room with a terrace. There are several television screens and guests will be able to enjoy views towards Mount Lycabettus. The hotel’s Restaurant is Meat Me, known for its fresh grilled meat. This white restaurant is decorated with bright green furniture and offers many traditional Greek dishes. 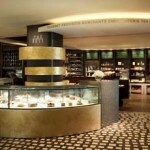 The Moët et Chandon bar has a lounge area where guests will be able to enjoy champagne. There is a café that serves coffee made the local way. The hotel has its own gym. Next to the gym guests will be able to relax in the hotel’s large steam room, which can be used as a sauna. There is a large business center at the hotel with several computers and Internet access. Guests will be able to hire assistants, interpreters and translators for meetings. Guests will be able to buy tickets at the reception desk, and the hotel can organize tours and make restaurant reservations. The hotel can provide customers with useful addresses. Guests will be able to rent cars and limousines. For an extra price the hotel provides a pick up service to and from the airport and the city’s main port. 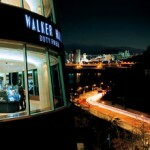 The hotel offers a transport service to the casino, a nearby department store and the ferry port. The hotel is located in the Psiri neighbourhood, in the center of Athens, near the Town Hall. A short walk away from the hotel guests will find ancient monuments and several streets filled with shops, and Syntagma Square is located nearby. Near the hotel there is a subway station that connects the hotel to the city. The neighbourhoods of Monistiraki and Plaka are a short walk away, and visitors will be able to visit the National Archaeological Museum. The city is known for its many landmarks and museums, and guests can visit the Benaki Museum and the Parthenon.